Make bracelets for friends and family. Use the friendship wheels to make 10 colourful bracelets. Fast, easy and fun. Suitable for 5 years and over. This set includes: Wooden dolly spool, wooden needle, six pieces of starter yarn, complete instructions and illustrations. The spool knitting tool even non-knitters will enjoy! Use your finished knitted cord for bracelets, anklets, hoodie ties and more! 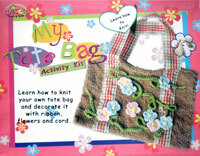 Learn how to knit your own tote bag and decorate it with ribbon, flowers and cord.